Don Felder is renowned as a former lead guitarist of The Eagles, one of the most popular and influential rock groups of our time. Felder originated the music and co-wrote The Eaglesʼ biggest hit – the iconic, Grammy-studded smash “Hotel California”. There are a limited number of VIP tickets which include access to The Kirk, KPC’s VIP lounge, and a meet and greet with the artist. Don Felder is renowned as a former lead guitarist of The Eagles, one of the most popular and influential rock groups of our time. The bandʼs record-setting compilation Their Greatest Hits (1971-1975) sold over 29 million copies in the U.S. alone and was awarded by the RIAA the top-selling album of the 20th Century. Currently Don and the Eagles have sold more than 83.5 million albums. A member of The Rock and Roll Hall of Fame since 1998, Felder served as a member of The Eagles for 27 years, putting his mark on numerous Eagles milestones. Felder originated the music and co-wrote The Eaglesʼ biggest hit – the iconic, Grammy-studded smash “Hotel California” – along with fan favorites like “Victim of Love” and “Those Shoes”. He became immediately celebrated for his lyrical, signature guitar work on legendary songs like “Hotel California,” “One of These Nights,” “New Kid In Town,” and numerous more. “Hotel California” was recently voted the Number 1 best 12 string guitar song in the world by Guitar World magazine. After leaving the group in 2001, Felder also became a New York Times bestselling author when his riveting confessional memoir “Heaven and Hell: My Life in The Eagles” proved a major commercial triumph upon publication in 2008 and went on to become a New York Times best seller. 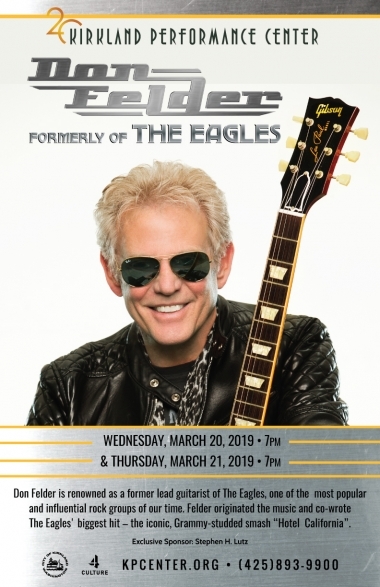 Four time Grammy award winner, Rock and Roll Hall of Fame member, New York Times best selling author, amazing guitarist and captivating performer is the best way to describe Don Felder today. Felder has not only worked with The Eagles but also in both sessions and live performances for numerous music legends spanning the musical spectrum: The Bee Gees, Peter Frampton, Bob Seger, Michael Jackson, Alice Cooper, Kenny Loggins, David Crosby, Graham Nash, Boz Scaggs, Warren Zevon, Joni Mitchell, Stevie Nicks, Vince Gill, Stevie Wonder, Elton John, Paul Simon, Diana Ross, Barbra Streisand – and even old friend, Steven Stills. Don is currently touring worldwide in support of his new CD “The Road To Forever” which features some of the best musicians and close Felder friends in the business including Crosby, Stills & Nash, Tommy Shaw (from STYX), Randy Jackson (American Idol). Steve Lukather and David Paich (Toto). The latest single “Wash Away The Pain” has reached #4 on the classic rock media charts between Eric Clapton and the Rolling Stones and has been critically acclaimed throughout the industry.